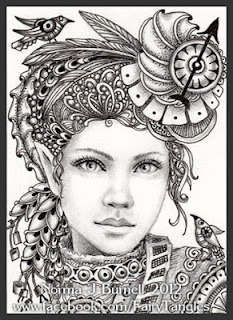 Clarissa Clockworks is a Futuristic Steampunk, Fairy-Tangle™. 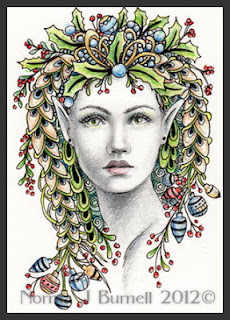 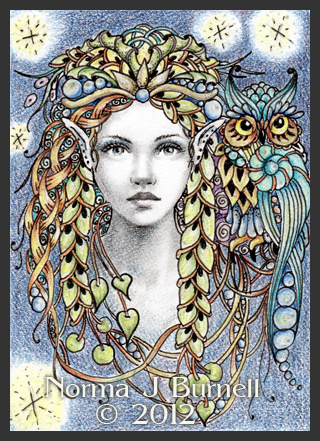 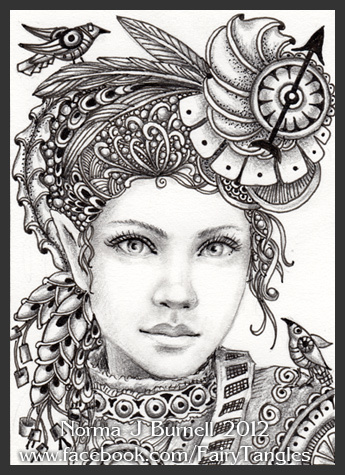 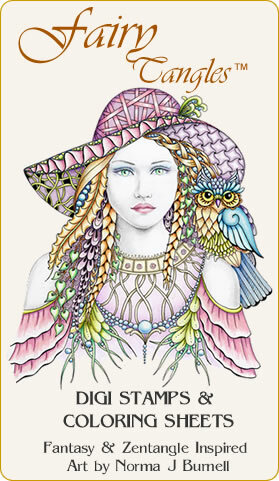 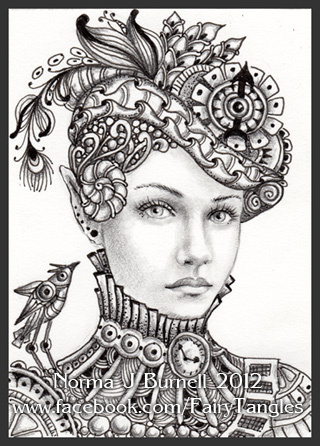 She is ACEO size, 2.5x3.5 inches, micron pen, graphite and touches of clear star glitter pen on smooth bristol board. For those of you interested, she and the two below will be listed on Ebay tonight. Drawing a few ACEO's - Holly & Stargazers - both 2.5x3.5 inches, micron pen, graphite, Prismacolor pencils and glitter pens on smooth bristol board paper. 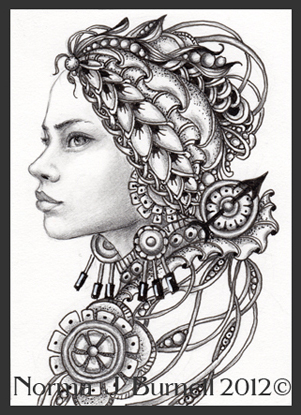 "Ruby" - here's Ruby, 2.5x3.5 inches, Prismacolor on Art Spectrum Colourfix paper. 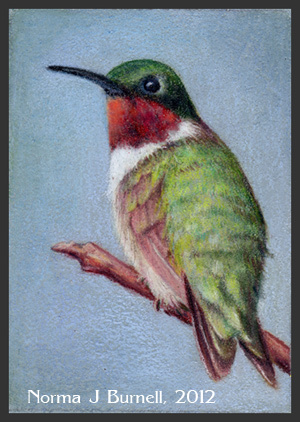 All the little hummers have flown south, where it's warm and cozy, unlike the little bluejay who'll spend the winter in my yard eating sunflower seeds and peanuts! 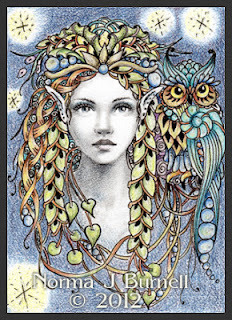 "First Flurries" ACEO, 2.5x3.5 inches. 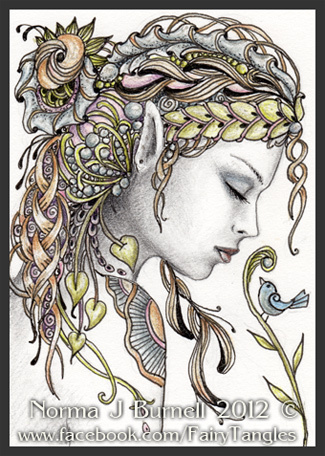 Prismacolor on Art Spectrum Colourfix Coated paper. 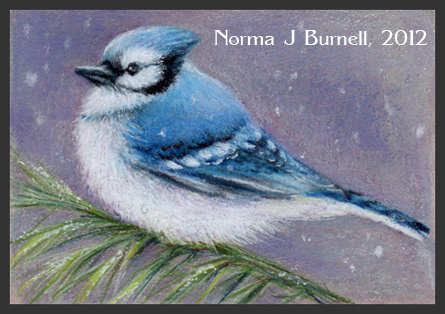 This little bluejay is puffing himself up against the cold...waiting for the sunflowers to be put in the feeder...love the jays!